The commonwealth is one of 10 states and D.C. to receive a $100,00 grant, which will help with early childhood education, healthcare, and childcare. 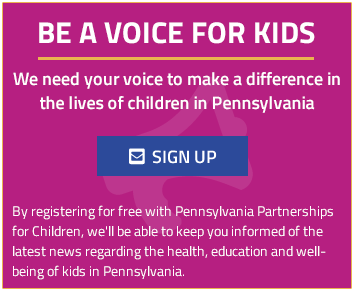 Continue Reading »"New money to help toddlers’ education and health in Pennsylvania"
Continue Reading »"Pennsylvania Wins Nationwide Grant Competition – Set to Expand High-Quality Prenatal-to-Age-Three Services to Pa. Infants and Toddlers and Their Families"
More people are reporting child abuse and neglect than ever before, with referrals spiking 76-percent in recent years. That’s according to a newly-released study addressing Pennsylvania’s child welfare system. Continue Reading »"PA Report: Child Abuse Reports at All Time High"
Pennsylvania Partnerships for Children (PPC) today released its annual State of Child Welfare report, a five-year snapshot on child well-being that this year shows increased public awareness of child abuse and neglect and positive improvements in mandated and permissive reporter requirements has helped fuel the highest recorded number of referrals in the state to date. Continue Reading »"2019 State of Child Welfare Shows Child Abuse Referrals Are The Highest Recorded To Date"
Higher numbers of people reporting child abuse and neglect in Pa.
More people are reporting child abuse and neglect than ever before. A snapshot of Pennsylvania’s child welfare system has revealed abuse reports climbed dramatically the last few years. Continue Reading »"Higher numbers of people reporting child abuse and neglect in Pa."